Sustainable Construction Materials: Sewage Sludge Ash, part of a series of five, aims to promote the use of sustainable construction materials. 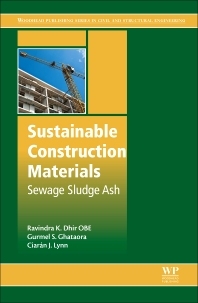 It is different from the norm, with its uniqueness lying in the development of a data matrix sourced from over 600 publications and contributed by 1107 authors from 442 institutions in 48 countries from 1970 to 2016, all focusing on the subject of sewage sludge ash as a construction material, and systematically analyzing, evaluating, and modeling the information for use in cement, concrete, ceramics, geotechnics, and road pavement applications. Related environmental issues, case studies, and standards are also discussed. The book helps users avoid repetitive research and save valuable resources, giving them more latitude to explore new research to progress the use of sustainable construction materials. It is structured in an incisive and easy to digest manner. As an excellent reference source, the book is particularly suited for researchers, academics, design engineers, specifiers, contractors, developers, and certifying and regulatory authorities who seek to promote sustainability within the construction sector. An excellent reference source for researchers, academics, design engineers, specifiers, contractors, developers, and certifying and regulatory authorities seeking to promote sustainability within the construction sector. Dr Gurmel S. Ghataora, Senior lecturer, University of Birmingham, UK. Over 40 years’ experience in the geotechnical engineering industry and academia. He has been at the University for over 25 years, where in addition to his teaching, he is the Head of Postgraduate Admissions for all taught programmes in Civil Engineering. He has supervised over 50 research students and authored over 180 articles. His interests include geotechnics of earth roads and railways, and sustainable construction materials. Amongst his many inventions are zero-compaction trench backfill made from as-dug materials, fibre reinforcement of clayey soils, improving the stiffness of railway tracks without removing the track, a novel railway drainage system and remediating acidity in colliery spoil using waste materials. Current studies include the durability of concrete made with recycled concrete aggregate and municipal incinerated bottom ash. He is a member of the Institute of the IOM3 and sits on two TRB committees. Ciaran J. Lynn, PhD doctoral researcher, University of Birmingham, UK. He received his MSc in Engineering from Trinity College Dublin, Ireland and BE in Civil Engineering from University College Dublin, Ireland. His research interests lie in the areas of sustainable construction and the appropriate use of secondary and recycled materials, including in concrete, geotechnics, road pavements and ceramic applications. He is an active contributor in these areas, including publications on the use and environmental assessment of incinerated ashes as construction materials. He is currently involved in a number of ongoing projects focusing on sustainable concrete construction.